For cyclists, there’s still an opportunity to improve their Cape Town Cycle Tour seeding by entering the upcoming PPA Sportive #2 on 17 February. The second event in the eight-event PPA Sportive Series is being held at the Windmeul Cellar and, with just one big climb, is the perfect event to set a time that will bump riders further up the Cycle Tour starting groups. There are two routes in the event – a 91 km or 38 km – and the longer version will be the one riders would need to enter in order to improve their Cycle Tour seeding. It’s a relatively flat route profile with the only climb coming at 35 km when passing by Riebeek Kasteel. Starting at Windmeul Wine Cellar on the Voor-Paardeberg road, Agter-Paarl, riders will head out toward and through Wellington, swinging out left towards Hermon on the R44, left again on the R46 to Riebeek Kasteel (and that climb), before returning to the venue via the R45. The shorter route is even flatter, with just under 400m of total elevation gain. It leaves Windmeul Cellar on the R44 and takes a left on the R45 in the direction of Malmesbury. Before getting there though, the riders will take another left onto Slent road and later another onto Vrygruns road that will take them past Paardeberg Cellar and back to Windmeul. Online: go to pedalpower.org.za/events and you’ll see 2019 PPA SPORTIVE #2 highlighted in red near the top of the list. Click the “enter” tab. Entries will close on Thursday, 14 February at midday. Registration: takes place on the morning of the event at Windmeul Cellar from 05h00. Water points: the 91 km route has three spread out evenly along the course. The 38 km route has one. This series of fun rides is aimed at all cyclists, from beginners to experienced riders, and offers the perfect platform for those wanting to keep fit riding road events throughout the year, improving their times and setting a new personal bests. 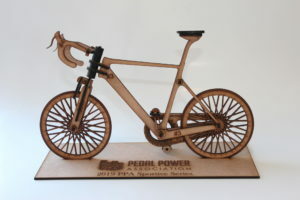 There are seven events remaining, spread throughout the year: visit www.pedalpower.org.za for more information. However, even if riders didn’t do Sportive #1, or won’t manage to do all the events, you’ll still be able to buy the missing pieces at a very reasonable cost. We still want everyone to have that trophy to display at their home or office.